Are you tired of using corded drills and having those annoying cords getting in the way? Do you need a good cordless drill that still has a lot of power behind it? Or maybe you just need a new drill because your old one is not cutting muster anymore. 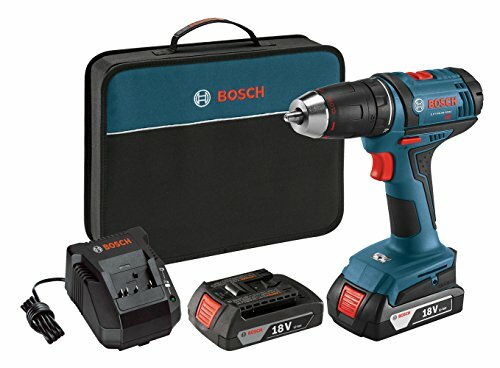 The point is that it might be time to buy a new power drill, and if it is, you might want to take a closer look at the Bosch Compact Drill Driver Kit. This is a drill with a whole lot of power, one that comes with a few accessories, and one that can definitely handle some pretty big jobs. The Bosch Compact Drill/Driver Kit is a fairly new model, one could say an upgraded version of several older Bosch power drills. The big difference here is that this drill doubles as a driver, which is more or less just a power drill on steroids. The point we are making here is that the Bosch Compact Drill/Driver Kit is built for power and torque. It’s a fairly new model that comes with quite a few cool features that you might really appreciate. As far as drills and drivers are concerned, this particular model is not even that expensive, something we do always like. For one, the Bosch Compact Drill/Driver Kit is intended for people who need a drill and a driver in one convenient tool. In other words, this drill can do everything that a drill and a driver can do, but it comes to us in one nifty package. As we have said before, this drill is built for power – for driving screws through hard materials. However, it is also built for speed, which makes it ideal for basic drilling and screwing needs. At the end of the day, if you need a drill and a driver for whatever project is coming your way, the Bosch Compact Drill/Driver Kit might just be the right option for you. When your purchase the Bosch Compact Drill/Driver Kit, you don’t really get much else except what is needed to actually operate it. Included in the box is the drill itself, 2 battery packs, the battery charger, the carrying bag, and a single screwdriver bit. As you can see, while the Bosch Compact Drill/Driver Kit is a good option to consider, it does not really come with any extras. One of the best features of the Bosch Compact Drill/Driver Kit is that it is both a drill and driver in one. It features a dual speed setting, one that has a whole lot of torque for driving and one that has more speed for screwing and drilling. As you can see, this drill is very versatile. What is impressive is that the Bosch Compact Drill/Driver Kit has so much power, yet is so small, lightweight, and battery powered. This drill can reach a top RPM of 1,300 with a top torque of 350 pounds, which is quite impressive. The 20+1 clutch settings which the Bosch Compact Drill/Driver Kit comes with are good too. They help make drilling more versatile, accurate, and it stops bits and screws from getting stripped. We also like how the Bosch Compact Drill/Driver Kit is small and lightweight. It comes in at under 3 pounds, making it one of the lightest drill and driver combinations in existence today. This makes it very convenient; it can fit into relatively small places, and you don’t have to be a muscle man to use it for more than a few minutes. Speaking of convenience, we also like that the Bosch Compact Drill/Driver Kit is battery powered. Not having to deal with power cords and AC plugs is always a bonus as far as we are concerned. Just like with all other power drills, there is really not much to say in terms of setup or using it. If you want to drill or screw something into wood or other soft materials, use the speed setting. On the other hand, if you want to drive a big screw through something hard, you should use the torque setting. 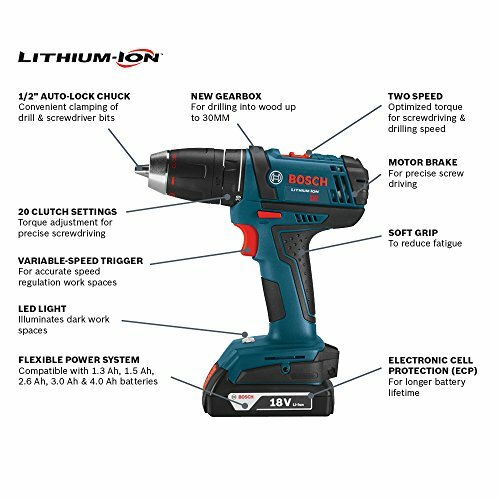 Other than making sure to have your batteries fully charged, there is nothing special to know about using the Bosch Compact Drill/Driver Kit. In case you are not a fan of this power drill we have reviewed for whatever reason, you can always take a look at the SKIL 6335-02 7.0 Amp 1/2 In. Corded Drill. The real difference here is that the Bosch is both a drill and driver, whereas the SKIL is only a drill. So, while the SKIL might have a little more speed, it does not have as much torque as the Bosch. However, the SKIL is a corded drill, so you never have to worry about batteries, which can be nice, depending on your perspective. Also, the SKIL is a little more versatile in terms choosing the drilling speed, plus it has a good side handle for increased accuracy too. Seriously, if you need a cordless drill with lots of power and torque, this Bosch Compact Drill/Driver Kit is a really good option to keep in mind. It is designed to handle some pretty big jobs, it is durable, and you don’t need to mess with power cords. In our opinion, the Bosch Compact Drill/Driver Kit is currently one of the best cordless power drills on the market at this time.